Ethereum has taken an experimental approach to blockchain technology, by pushing the code to its absolute limits. Whilst this has been a positive experiment for the wider community, it means that Ethereum is essentially always in beta, which presents a real issue for businesses utilizing blockchain technologies. 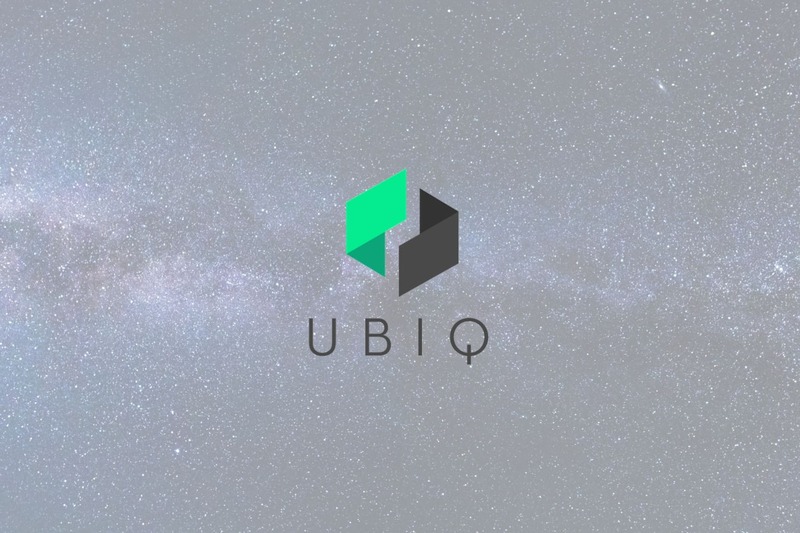 Ubiq is an Ethereum Virtual Machine (EVM) compatible blockchain and smart contracts platform that launched an independent network, whose genesis begins with the Nucleus Block. Ubiq is derived from the Ethereum codebase, sharing much of its functionality and programming language. Ubiq took a different philosophical approach on code releases, decentralization, mining and monetary policy. Whilst they see a bright future for both platforms, and do not self-recognize as an Ethereum competitor, there was an acknowledgment that businesses who wish to adopt this technology now may require an alternative product. One with a reduced release schedule and a more stringent testing process to allow for a more stable foundation to build upon. Extensive observation and testing are at the core of the Ubiq ethos. On release, one major change Ubiq had implemented was their own difficulty adjustment algorithm (named Flux) to maintain an accurate block time. Whilst attending the Ethereum Developer conference (EDCON) earlier this year, the Ubiqsmart team had their chance to thoroughly test their Flux algorithm and blockchain overall. Ubiq was approached by whiteblock.io who offered them the opportunity to be one of the first case studies for their Blockchain Testing as a Service (BTaaS). We will discuss some of the results from this case study below. To measure the performance of both platforms, whiteblock gave careful consideration to the testing parameters, to produce a set of results without bias. Each test series performed an incremental increase in the gas limit, starting at 4 million and moving to 80 million gas. The results were then plotted to observe any correlation between any of the established metrics. For a full breakdown of the test parameters and full results, a link to the whiteblock case study can be found here: https://whiteblock.io/library/ubiq-report.pdf. Overall, the benchmarking was extremely useful in testing the capability of the Ubiq network. 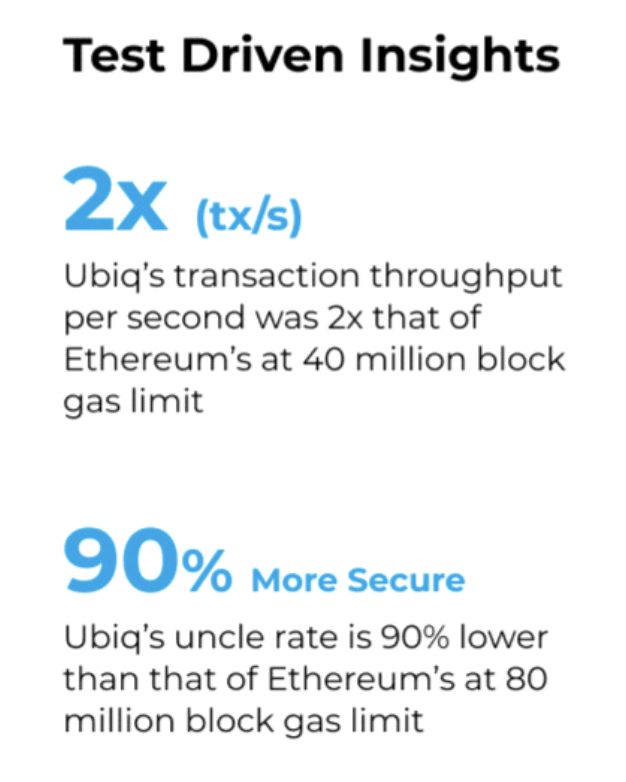 It found that, on average, with block limits set at 40 million, Ubiq has a 2x Increase in transactional throughput per second when compared with Ethereum and at a 80 million block gas limit, it has a 90% lower uncle rate. The uncle rate is a measure of overall network security as more of the networks hashrate is being used in the processing of new transactions. This is also allows for the higher level of transactional throughput. The Ubiq team holds a close relationship to many of the developers within the Ethereum community and are not trying to be “the next Ethereum.” The results are surprising and offer a good incentive for businesses looking for a more stable blockchain to build or test on. For full disclosure, when the report mentions “more secure,” this should be viewed from the perspective of if both chains have an equal hashrate, Ubiq would be 90% more secure due to the significant reduction in uncles. With the spectre of increasing transactional costs on the Ethereum network, Ubiq provides a solid alternative to developers wishing to build and utilize the Ethereum Virtual Machine (EVM). Gas costs are over 99% cheaper for transactions on the Ubiq platform and the team have a steady commitment to remaining as a Proof-of-Work (PoW) coin, incentivizing miners to switch over when Ethereum transitions to Proof-of-Stake (PoS). The development team is also working on a bridge to the Ethereum network, to assist them with their immediate scaling issues. Kris has been working in the tech industry for over a decade, with new and innovative technologies, most recently becoming a fan of the revolutionary potential of the Blockchain. He works closely with the Ubiq team and is a long-standing member of their community. I might have looked over something but i’m happy to hear if I have miss understood in anyway. The context stated in which “Ubiq is 90% more secure than Ethereum”, Given the chains have equal hashing power and all transactions are being sent @80M Gas price. Less 90% less uncles are created using the Ubiq chain. Grand. Ethereum doesn’t waste uncle blocks, It rewards them and ties them into the chain using a light weight version of something called GHOST (Greedy Heaviest…somethingsomethingsomthing). Long story short. Uncle blocks are tied into the chain and not wasting the hashing power that went into them but instead making the chain more secure. Happy to have a chat about it if I have missed something. Uncles add unpredictable inflation and also make the head of the chain less certain. A higher uncle rate means you can’t trust the latest block as much as it has a higher chance of getting uncled. The head of the chain can be uncled if the node reorgs if the next block was built on a competing block, e.g. node accepts block 100a, block 101 is built on top of block 100b, block 100a gets uncled, then the node has to reorg. At present ETH has a ~11.6% uncle rate and ubiq has a ~1% uncle rate, we average 12 uncles in a day.